Kirkcaldy defensive frailties again cost them dearly in the early stages of a game. With only 12 minutes played Selkirk had scored three tries to a solitary counter for the Blues. Whenever the visitors had possession, a lot of it handed to them, they looked likely to score. The bonus point try came up five minutes later with the Borderers looking as if they could score at will. Apart from a smartly taken solo Scott Anderson try born in a line-out tap down 30 metres out, Kirkcaldy were little more than spectators. Concentration levels, speed of thought and anticipation should have been much higher to cope with a such a pacy side. 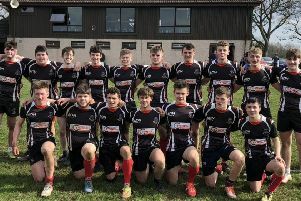 To their credit Kirkcaldy eventually came to terms with this quality side, gaining parity in the scrums and had a remarkable return in their losing cause of six tries. This was the third consecutive game in which Kirkcaldy had a torrid start with the opposition just about out of sight by half time. Only in the second half did the Blues really compete but even then they conceded counter attacking tries. Director of Rugby Mark Henderson bemoaned yet another sluggish opening half hour but praised the second half recovery which earned a vital bonus point. “There was a flatness in the side from the kick off and that gave Selkirk a racing start from which we never really recovered," he said. "Communication between players appears to be a problem just now from which opposition will take advantage. "Very much on the positive side, we buckled down in the the second half and even with a second string front row we competed well. "Apart from the defensive lapses there was a lot of positives to be taken, including the four try bonus point which could be vital at the end of the season." "Michael Harper is improving every game at tight head and he was also very active in the loose, carrying well. "There was also a very pleasing debut for winger Timmy Kennedy, signed last week from Howe of Fife. He can be a real asset to our squad." Kirkcaldy had no one one to match the pace and ball skills of Selkirk winger Darren Clapperton who ended the game with six tries, a figure matched only once previously in a league game at Beveridge Park when the Blues' Dayle Turner had six in the discounted game against Aberdeenshire. Selkirk's early advantage ebbed a bit in the second quarter. Tries from Conar Littlejohn and Josh Laird along with a Finlay Smith conversion narrowed the gap to 17-22 five minutes before half time. However, this Kirkcaldy recovery abruptly ended before the interval as Clapperton made good possession from an attacking line-out to go in for his hat-trick. This left the Blues with a half time deficit of 29-17. Selkirk were at their best in the third quarter dominating possession. Everything was done at pace and an accuracy that Kirkcaldy could not match. A Matt Harvey try brought the Blues a little nearer the Selkirk 48 point tally, and also brought a four try bonus point to Beveridge Park. Timmy Kennedy who had earlier caught the eye with some strong running marked his first start with his side's fifth try converted by Smith. Before replacement Sean Laing had his first senior Kirkcaldy try, the Blues had coughed up the ball in their own half to see Selkirk lock Donald Nichol blast away for a score converted by Henry Birthray. Kirkcaldy: F Smith, J Devine, C Littlejohn, J Laird, T Kennedy, G McKenzie, S Anderson, W Beattie, C Hamilton, M Harper, C Wood, S Robertson. R Bonner, D Turmer, M Harvey. Replacements: G Queen, S Laing, J Denton, J Moffatt, R Brown. Selkirk: H Birthray, N Pavlovski, A McColm, R Nixon, D Clapperton, S Tough, A McColm L Pettie, K Bett, B Riddell, A Renwick, D Nichol, S Nixon, S McClymont, E McDougall. Replacements:- C Higgins, C Graur, A Mackay P Forrest, S Cant. Cumulative: 11 Josh Laird; 10 Connor Wood; 8 Struan Robertson; 6 Rhys Bonner, Dayle Turner, Matthew Harvey; 5 Jack Pow; 4 Finlay Smith; 3 Greg Wallace, Michael Harper; 2 Conar Littlejohn, Alex Black, Owen Bonner; 1 Jack Denton, Craig Hamilton, Timmy Kennedy.